It was the worst incident of its kind in Nigeria for many years. Attacks on police, security service and immigrations offices left 150 dead. The BBC, in reporting the atrocity, ask the question, “Is Nigeria on the brink?”. It is not easy to answer that question. Certainly things are very serious. Boko Haram seem set on causing maximum terror – last week they threatened to carry out jihad in the north – and they don’t seem bothered whether they kill Muslim or Christian. Suggestions that the terrorist group have infiltrated the security services can only add to the concern. This surely is the toughest test of the President who, as a Christian, will be harried by Boko Haram much more than would be a Muslim President. But with the Christian States in the south anxious to avoid the imposition of Sharia Law (the ultimate objective of Boko Haram), the pessimist could certainly foresee a north v. south clash. Might the pessimist even foresee civil war? Nigeria needs our prayers and, perhaps even external intervention, or things might indeed get worse. 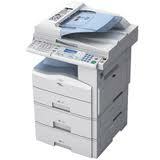 We have just had the office copier repaired. It needed a new PCU. The original PCU has lasted for eight years and printed 400,000 copies, so this replacement will probably outlive the rest of the machine! Photocopier repair man Paul was telling me that new copiers used to come onto the market every 5 – 8 years. In between there were upgrades but not new models. Today, apparently, a manufacturer will market a new model every 12 – 15 months! Paul was explaining that it was the speed of technological enhancement that was responsible. Technological enhancement coupled with consumer demand. Consumers want faster and faster machines with clearer and clearer images. Jobs that used to be the specialist domain of the local print shop can now be done in your own office. All this got me thinking. How fair is it that we are obsessed with getting better and better bits of kit for our offices but don’t worry about people dying in far off parts of the world. How concerned is your average office worker in Europe or USA with the fact that a child dies every 4 minutes from water-borne disease; or that women around the world spend 200 million hours every day walking to fetch water? Perhaps if there was some way to link our work to child deaths or water harvesting, we might take more of an interest. Perhaps if we all had to stop work every 4 minutes to mourn for a child, we’d all become so fed up with our lack of productivity that we’d demand that something was done. That would be consumer demand in action. But that is also a dream. In the meantime, those of us who care have to keep shouting about it. Those of us who care have to keep raising awareness and raising money; and one day, just maybe, the rest of the world will sit up and look beyond their insulated bubble and take notice. Then you might see consumer demand make a real difference. D id you know that, apart from the obvious political surveys, Gallup run an annual survey to reveal the most optimistic race on earth? If you are British, you’d have no idea about the annual survey because optimism is not a word found in the vocabulary of many of us! But, guess what? 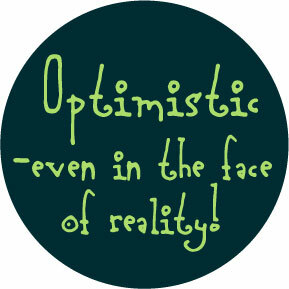 Uh ha, you’ve guessed already …… The Most Optimistic people in the world 2011, as surveyed by Gallup, (roll of drums, rapid loud beats) are the Nigerians! And, guess what, this follows their top spot in 2010 as well! Perhaps that is why it is always so hard to get things done in Nigeria – because there will always be another chance to do it tomorrow! I thought that mañana was a Spanish word but it seems that the Nigerians coined it first. Now I understand why my British urgency doesn’t travel too well to Jos; because nothing is too important that it must be done today ……because tomorrow will be fine; it’ll be OK.
How old do you have to be not to ‘get’ twitter? I thought I was reasonably up to date but Twitter has passed me by – even though I opened a Twitter account two years ago. But then I discovered that Dan Walker has in excess of 95,000 followers (he’s trying to get 100,000 by 31.12.11) and he writes nonsense much of the time. Admittedly amusing nonsense. So, I thought, if he can do it, so can I. Except I don’t have a couple of million people watching me every Saturday lunchtime. I suppose I had better sign up for a course on how to get the most out of social media. Until then, it’ll just be you and me. Unless you can persuade your granny to tweet occasionally! What if you lost 50p? If you went out shopping and dropped 50p, would it matter to you? If you had a coffee while you were out at the Sales and left 50p change on your tray by mistake, would it effect your life? What if it happened every day? Well, that could cost you £15 a month but, losing it a little at a time, we probably wouldn’t notice it. Admittedly, that is not true for us all. There are people in UK for whom 50p is a large sum and who would really notice the loss of £15. But that is the minority and, if you know someone in that position, you ought really to help them. So, what would £15 achieve if, instead of losing it, you donated it? Clearly, I can only speak for TASTE but, given regularly, it can make a great difference. Let’s do the sums – £15 x 12 = £180 plus Gift Aid (£45) = £225. That would pay for a hand pump that would provide for up to 500 people. If you both work and you both donated that 50p, each year you would donate enough money to pay all the staff allowances for the borehole installation in that same village. Think about – we can lose money every day and not notice it. Presumably that means we could donate the same amount and not even notice it. But donating that money will change lives in Nigeria; it will improve health and aid education; ultimately it will save some lives. Think about it. I have.